You've been here before and you'll be here again. Have a car snow shovel ready. 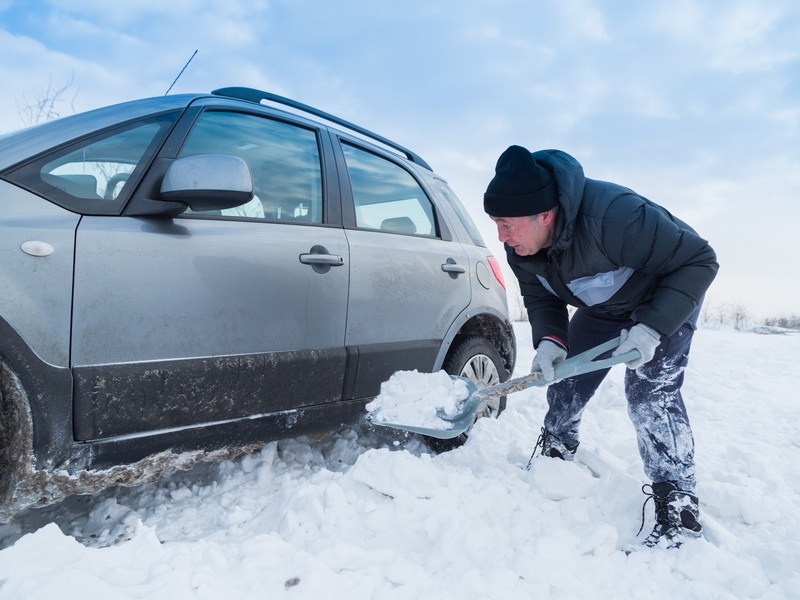 Most homeowners keep a snow shovel in their garage or shed, but what if you need to shovel out your car or clear a parking spot away from home? Having a shovel within reach (or a pop of the truck) can be a lifesaver during snowmageddon. That’s why we recommend stashing a snow shovel in the cargo space of your vehicle if you're lucky enough to live in a cold climate. The trick is to find a shovel that’s compact in size but durable enough so you won’t have to worry about it snapping in half. These 5 best car snow shovels may look small but they're tough. The design of the Power Foldable Shovel ($25) is ingenious because it folds up to a miniature 12.5" and comes with a storage pouch to easily fit in your car without taking over the entire trunk. When you need to shovel, just unfold to its full length of 26" and go at it. Not only will it dig you out of a wintery situation, but it will also have your back in the warmer months for camping or gardening. Most of the shovel is plastic which makes it very portable at only 2 pounds. The aluminum blade lets you confidently cut into the snow that's in your car's way. If you prefer an aluminum car shovel to plastic, but still want one in a shrinkable size, the Cartman Sport Utility Shovel ($19) is for you. This shovel is constructed from a lightweight and durable aluminum that weights less than 2 pounds. The handle shrinks from 32" to 25" so you can keep it in your car at all times. If you need to carry it in a backpack, you can simply take the shovel apart into 3 pieces. You may not want to shovel your full driveway with this one, but it's the ideal solution for winter emergencies. Another excellent collapsible option is the Lifeline 4004 Snow Shovel ($25). As the name suggests, this aluminum shovel will work hard to get you out of a sticky situation. It shrinks down from 32" to 26" and disassembles into 3 pieces should you need it any smaller. Despite its size this shovel is sturdy, light (1.6 pounds) and dependable post snowstorm or on a hiking and camping excursion. An added perk of the Lifeline is that you can choose from a rainbow of colors if the standard black and orange aren't your thing. Not only are we fans this car snow shovel's name but also its versatility. 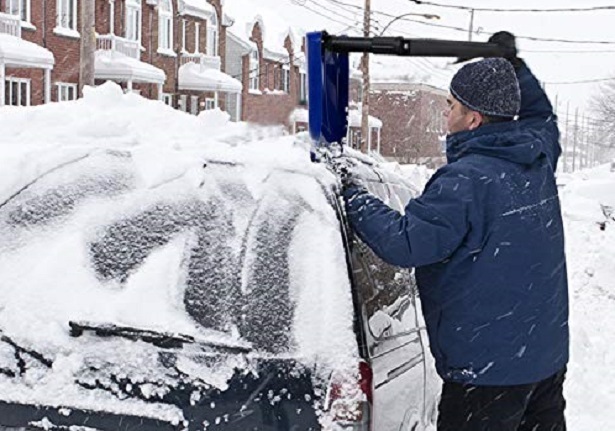 The Orientools Folding Snow Shovel ($15) is economical, packable and it transforms into 3 different positions including folding, verticle and horizontal to let you reach even the tough snow under your tires or on top of your vehicle. Just lock it in place to 90 degrees and you're ready to tackle anything winter throws at you. The majority of the shovel blade is plastic but the blade's edge is made out of durable aluminum allowing you to get into the icy stuff. The Snow Moover tool ($32) is much more than just a car snow shovel. It is a solution that gives you a windshield brush, squeegee, ice scraper and shovel all in one. This is ideal for the minimalist or the smart car owner who doesn't have the trunk space for four separate winter tools. Simply interchange the parts based on what winter driving woe you encounter. The shovel attachment comes with scratch resistant jaws which can break up ice and then scoop up the snow. This shovel tool extends up to 39" to let your reach either the snow on your windshield or under the tires.